Knocked him over in 0-3 win at Sassuolo. 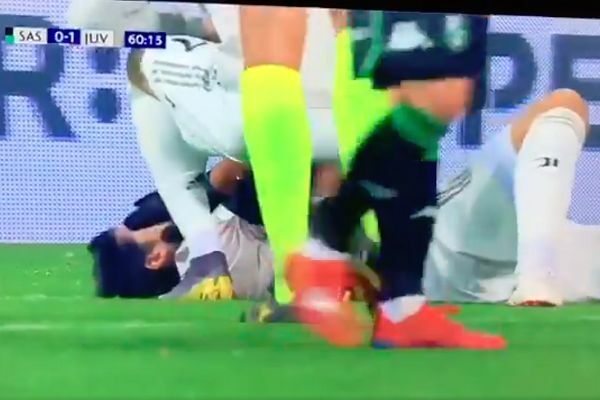 Cristiano Ronaldo whacked the ball directly into his Juventus colleague Sami Khedira’s face, knocking him to the floor during a 0-3 win at Sassuolo on Sunday. Both players scored in the Serie A clash at the Mapei Stadium but one attacking move came to an abrupt end when Ronaldo inexplicably fired a pass towards his teammate’s head. The German international midfielder immediately collapsed onto the grass after being hit by quite some force in the 61st minute. What could have been a shot aimed in the wrong direction bounced off Khedira and out of play behind the goal from outside the penalty area. A smiling Ronaldo walked over to him as he lay on his back holding his face. Friends again after the game, Khedira tweeted “thanks for the headache”.